Back in the good ol' days, when your neighbors were also your friends, people didn’t wall their property in with wood privacy fences, chain link fences, or cinder block fortress-like partitions. What they did do was put in a simple open fence with shrubs and flowers, or even a low hedge along the fence that made conversation with the people next door as simple as walking up to the property lines and chatting away. 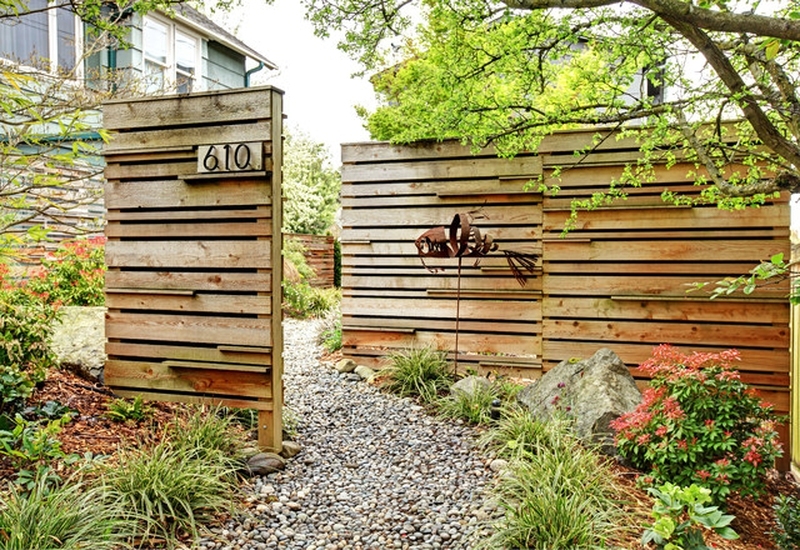 I have built enough spec homes in recent years to find that many people still do enjoy the concept of a “living fence.” Buyers have often remarked that this feature was one of the things that helped them decide to buy the home. This article will explain how to install a two rail, western red cedar fence, along with tips on planting to create a more amenable way to mark your property lines. Provided you live in the United States west of the Mississippi River, western red cedar is plentiful and most any fence supplier will either stock or be able to order everything needed to install a split rail fence. Usually they offer either a two or three rail option but unless you are really in love with the look of a three rail fence, why not spare some of the expense for both materials and labor and install the two rail version -- spend the saved money on a border garden alongside the fence. Western red cedar is not a common material east of "the big river," however. Cypress is more popular, but it just doesn’t have the same feel or look of red cedar. There are lumber suppliers to be found online who advertise free delivery but charge 20-30 percent more for the materials. This is by far the better option in most cases, as ordering from a western supplier will often cost more in delivery charges than materials. Step 1: Sketch and Count. Start with a simple sketch of your fence plan, allowing 10 feet between posts. Count the number of corner posts, end posts and interim posts, and add up 2 rails per section. (If there are a few large trees on the property line, it's best to just end the fence on either side rather than attach the rails to the tree). Posts are usually 7 to 8 feet long, but can be cut down to avoid extra digging or a fence that looks too high. Visit your local lumber yard or order what you need online. Step 2: Dig the Holes. Excavate the holes to a minimum of 2 feet deep and a maximum of 3 feet deep with a post hole digger, a hole shooter (a short, narrow blade shovel) and a stout metal bar or crowbar. For hard rock or difficult soil, consider hiring a small drilling contractor as the time and hard labor may be worth the price. Step 3: Lay Out the Plan. Lay out the fence materials, with posts leaning in the holes and rails alongside. If there is a section that must be shorter than ten feet, just cut the rails down. Notch the ends to fit two rails in the pre-drilled post. Step 4: Treat the Wood. Pre-coat the posts with a wood preserver such as Penofin - 3 coats is preferable. For heavy moisture regions or termite country, wrap the post bottoms with 6 mil black plastic sheeting and secure with a hand stapler or tape. Step 5: Set the Posts and Rails. At a minimum, plan on setting both corner and end posts in concrete for stability. Wedge the post to plumb using a 3 foot or longer level and use stones for wedges. Then add concrete, tamping it firmly into the hole and ending just below ground level. Rails are designed to not need fasteners, but have a good supply of 4-inch exterior grade screws handy and use them whenever possible. Each post has a slot, and the rails simply slid into place, like inserting tab A into slot B. Step 6: Preserve the Wood. When complete, use 3 coats of wood preserver and re-coat whenever the fence looks “dried out,” or every 2 to 12 months. Step 1: Choose your Plants. Use native shrubs that won't need watering after the first few months of being planted, and are capable of withstanding regional weather, insects, and disease. Shrubs alone are fine and can be spaced singly or closer together as a future hedge. In cold country, evergreens and small native trees are about the only option, but further south in the States you can add color with flowering shrubs or multi-colored leaf shrubs. Step 2: Get Planting. Trees and shrubs will come in containers - simply dig holes slightly wider and deeper than the container and add 2 inches of gravel in the bottom. Remove the container and tamp the plant into place with extra topsoil. Make a raised mulch “ring” around the plant for water. Small trees will need to be staked in three directions, using any garden stake and nylon twine (a mulch ring is a good idea). To add space for flowers, clear a 2 to 3 foot strip along the property line, adding garden soil if you lack good topsoil. Step 3: Add Mulch. When planting is complete, spread cedar or cypress mulch for weed control and to maintain a finished look. Add more mulch throughout the seasons to maintain your desired look. Step 4: Keep Up the Maintenance. Initially, water almost every other day in a dry climate or at a minimum of once a week for 6 to 12 months until the shrub or tree is established. Weed and water often just after planting. It’s best to ask LOTS of questions from the supplier as to individual flower and plant needs. Flowers may need to be replaced often, depending on whether you choose annuals or perennials. After the first 6 months the tree stakes can usually be removed, but just use common sense as to whether the tree is stable enough to stand alone. Trees can be re-staked, if necessary. Now, sit back and enjoy your new living fence (and your neighbors! ).